1. Heat 3 tablespoons oil in an 8-quart saucepan over medium-high heat. Season kosher wings with salt and pepper; cook, turning once, until browned, about 13 minutes. Add roughly chopped onions, carrots, and garlic, and cook, stirring, until soft, about 8 minutes. 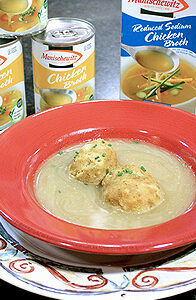 Add Manischewitz® All-Natural Chicken Broth, bay leaf, and salt; bring to a boil. Reduce heat to medium; cook until slightly reduced, about 25 minutes. Strain broth, discard solids, and return broth to pan. 2. Meanwhile, heat remaining oil in a 12-inch skillet over medium-high heat. Add minced onion; cook until soft, 3-4 minutes. Transfer to a bowl and mix with remaining ingredients. Using wet hands, divide mixture into six 3-inch balls. Bring broth to a simmer; add meatballs. Cook, partially covered, until cooked through, about 17 minutes. To serve, divide broth and meatballs among 6 bowls.